Offer woodpeckers their favorite nuts in a clean and innovative way with the C&S Woodpecker Treat Suet Plugs. Adding a suet plug feeder to your garden not only attracts non-seed eating birds, it also creates a tidy and natural-looking feeding station. These 3 ounce suet logs have almonds, corn, peanuts, and pecans throughout them for the delight of your birds, keeping them full of energy. The rounded shape of each log fits perfectly into suet plug feeders, and may also be placed on platforms for versatility. Add nuts to your feeding options with these Woodpecker Treat Suet Plugs. Made in the USA. 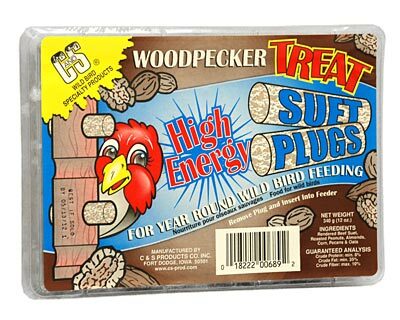 Note: This case pack includes 12 C&S Woodpecker Treat Suet Plug packages.